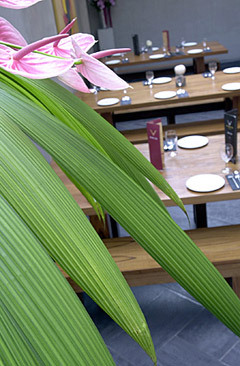 Contemporary fuses with traditional in this stylish, air-conditioned restaurant, ideal for dinner a deux. Brushed steel and concrete work remarkably well with the wood, cooper, bamboo and grey slate - perfect foils for some impressive Thai artefacts - prayer scrolls, ornate dragons and buddhas - and indigenous Thai art. Red lacquered hairs and dark wood tables set the scene for the dining experience to follow. The main dinning room overlooks a spacious mezzanine area, which is often reserved for private parties with a funky bar at the basement. The basement bar has a capacity for 100 people and is licensed until 2am, Tue-Sat. Alfresco dinning is available over the summer weather permitting. The staff are charming and attentive. The basement bar has a capacity for 100 people and is licensed until 2am on Tue-Sat. The whole of the top floor, and the basement bar are available for exclusive hire where you can dine from the ala Carte or set menu. Open: Noon-3pm and 6pm-11pm daily.